With the Guardian and others picking up on the tax avoidance issue, this shows every indication of being the story of the week. However, Autonomous Mind refers to my earlier piece about the role of EU law, and remarks on the "incredible ignorance of politicians". His target is Chairman of the Public Accounts Committee, Margaret Hodge, reported at length in the Daily Mail. 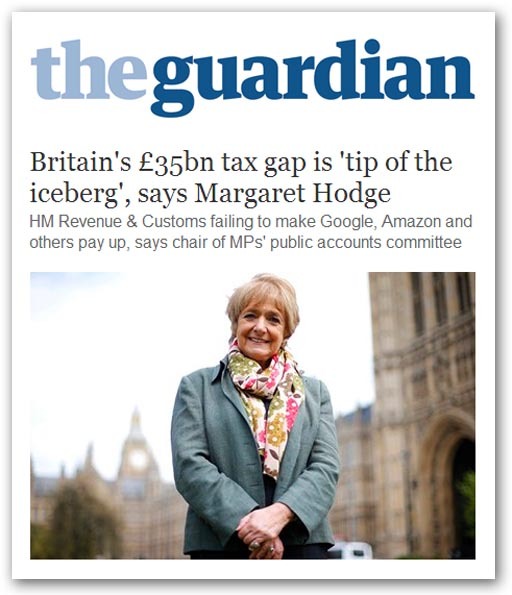 "The tax gap" – which has grown to £35 billion - "is really the tip of the iceberg", Hodge says, addressing HMRC's Jim Harra, director general of business tax at yesterday's committee hearing. Then getting into her stride, she says: "It looks to me that you should be litigating. Why have you not chosen to litigate and test your powers?" Not content with that, she then demands: "Why have you not litigated against one single internet company? ", adding, "Make a few cases, a few show cases. It's so bloody obvious". It is the Guardian, though, that records Harra repeatedly refusing to be drawn on the issue, telling Hodge: "What we have to look for is this: is there evidence that the offshore operation does nothing more than rubber-stamp?" But if "it's so bloody obvious", why, one might ask why Harra is being so equivocal. And., strangely, the answer is "bloody obvious". The Inland Revenue has already run a test case, the Thin Cap Group Litigation, with a ruling on 13 March 2007 from the European Court of Justice. It addressed freedom of establishment and free movement of capital within the context of the EU treaties, in a case where the imposition of corporation tax "on loan interest paid to a related company resident in another Member State or in a non-member country" was being challenged. The tax avoidance scam which is being exploited by many corporates is precisely that – loan interest paid to a related company in a non-member country, used to offset tax. And on this, the ECJ found that EU law "precluded legislation of a Member State" which restricted "the ability of a resident company to deduct, for tax purposes, interest on loan finance granted by a direct or indirect parent company which is resident in another Member State or by a company which is resident in another Member State and is controlled by such a parent company". Thus, to charge tax would be contrary to EU law, with a limited proviso – that this does not apply if it can be proved that the loan is a "purely artificial arrangement, entered into for tax reasons alone". This explains why Harra told Hodge: "What we have to look for is this: is there evidence that the offshore operation does nothing more than rubber-stamp?" But what is puzzling is why the director general of business tax did not come out in the open and explain to Hodge that this was an EU issue. However, this is not that puzzling – the elephant in the room is rarely revealed by civil servants. But then, Margaret Hodge should know that EU law applies, and should have been aware that this was the problem. But, as Autonomous Mind remarks, our politicians really are incredibly ignorant, matched only by the legacy media, none of which have pointed up the EU link. And that is incredible ignorance squared.